The Lawrence County Museum participated in the Oct. 5 downtown gallery walk. Two BNL students exhibited their work in the museum meeting room. A junior at BNL, Amelia has been interested in photography since she was 7 years old. She would like to make photography her career. Her exhibit was titled: "A Lawrence County Life." A junior at BNL, Emily has taken photography classes for two years and has found a life-long interest in the arts. Her exhibit was titled "Portraits in Abandoned Locations." Even though it was a rainy night, the gallery walk attendance at the museum was about 70 people. 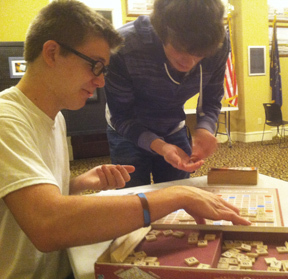 Some of the gallery walk participants also had fun playing Scrabble. Stonecutter's Cafe & Roastery hosted entertainment. Kat's Performing Arts provided the music and dancing. It was a dark and stormy night, and about 70 people braved the weather and experienced the exhibits at the museum. While there, participants could enjoy a game of Scrabble or watch the WTIU public broadcasting system presentation of life in Lawrence County—Hometown Bedford. Exhibit locations included The Wiley Center for Art, The Lawrence County Museum of History, Stonecutter's Cafe & Roastery, Twelve Months of Christmas, Ginger Threads, Evolution Tattoo, Smalltown Art Studio, BlueEyes & BareFeet, Limestone Cafe, Inklings Bookstore, By The Glass Productions. Kat's Performing Arts featured music and dancing. Smokin' Jim's BBQ served sandwishes and chili. Tent vendors included: Heather's Homegrown Handies, KW Bloom, and The Lovin' Oven with sugar-free baked good. The Gallery Walk was organized by Tara Jones of By the Glass Productions.